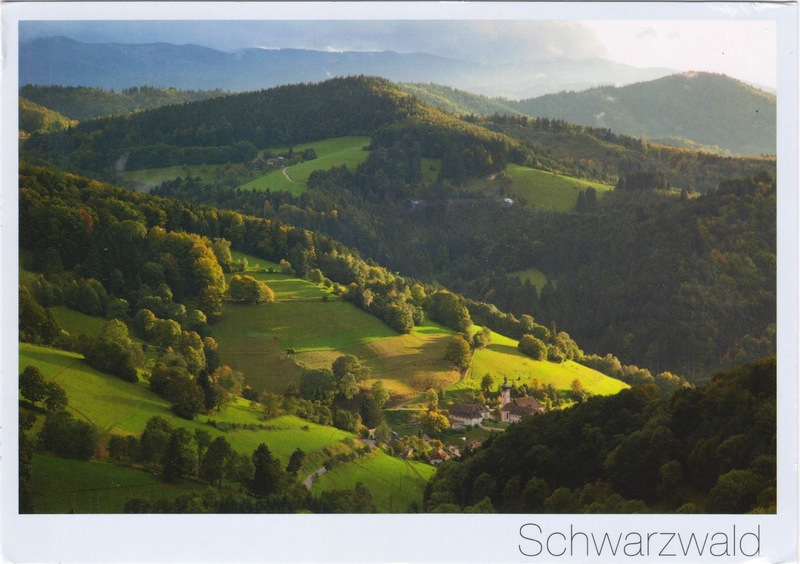 Postcard DE-4247507 from Germany shows the Black Forest (Schwarzwald in German) that is a great forested mountain range in the state of Baden-Württemberg in southwestern Germany. Bordering France, it is bounded by the Rhine valley to the west and south. Its highest peak is the Feldberg with an elevation of 1,493 meters or 4,898 feet. It is known for its dense evergreen forests and picturesque villages, which inspired some of the Brothers Grimm fairy tales. The cuckoo clock, a pendulum-regulated clock that strikes on the hours with a sound like a common cuckoo's call and has an automaton cuckoo bird moving with each note, was said to be developed and evolved in the region since the 1700s. It’s a destination for hiking and biking at vast nature parks, and skiing in winter.